Traffic intersections will be the first priority for the city’s mowing crews. Photo: Supplied. The city’s mowing crews are riding back into action with gusto amid concerns that Canberra’s public spaces have become overgrown – with potential safety problems for road users. Traffic intersections will be the first priority for the Transport Canberra and City Services mowing crews who returned from the festive break this week to find the grass had grown rapidly while they were away. “The hot weather and rainfall in late 2018 has helped fuel grass growth across our city,” Acting Director of City Presentation, Michael Brice said. 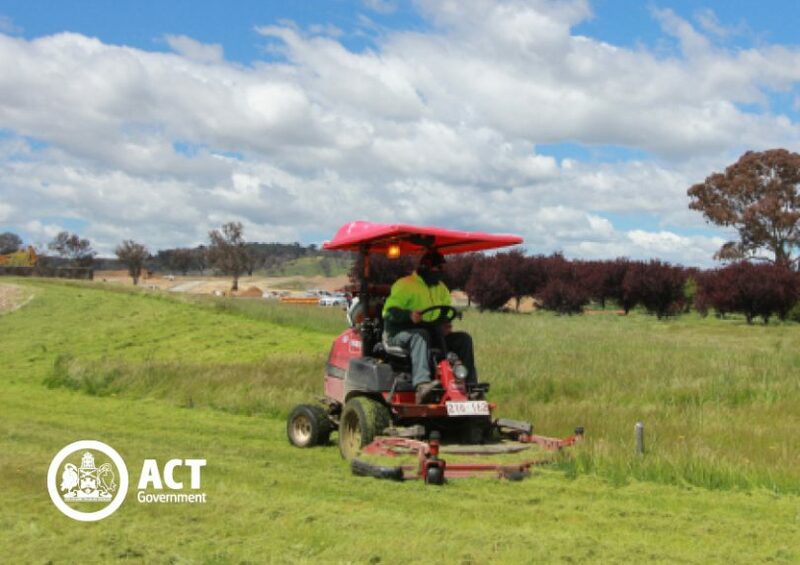 The ACT Government is responsible for mowing approximately 4,697 hectares of irrigated and non-irrigated grass in urban open spaces, sportsgrounds and at the urban edge. There is a base mowing fleet of 73 mowers which is supported throughout the mowing season by contract mowers. Mr Brice said that after focusing on traffic intersections, the mowing crews will target parks and green spaces on shared paths. “Of particular concern is the ongoing problem of African Lovegrass (ALG) which is the source of much of the long grass, particularly along main roads,” Mr Brice said. “ALG can grow very rapidly after being cut, particularly in response to rain and may throw seed heads as tall as 600mm within two to three weeks giving affected parts of the city an untidy and unkempt appearance shortly after mowing. “To help restrict the spread of ALG, strategies are being developed that include modified mowing practices and additional herbicide spraying, particularly adjacent to high-value conservation areas,” he said. “TCCS will be expanding the current program in areas that adjoin native grasslands and nature reserves, and will implement a reduction and containment program along main roads to help restrict the spread to non-infested areas. For more information about the city’s mowing program please click here. Have you been concerned about any overgrown public spaces? Let us know in the comments below. I’ll address here a common misconception – repeated below – about the self government referendum(s), taking off my bodybuilder cap and putting on my other cap as a Canberra historian. There were not two referendums about self government for the ACT. There was only one – held on 25th November 1978. There were 3 options – Local government, state government and No Change. 68% of Canberrans voted for No Change. There was another plebiscite of sorts about self government. It was conducted by 2CC in late 1976 and involved desks being set up at Monaro Mall, Civic and at Woden Plaza with people filling out ballot papers with a Yes/No option. This survey also returned a majority No vote. When self government was finally introduced there was no referendum or plebiscite. The Hawke government introduced a bill to the Senate in mid 1988 which was voted down initially because of the voting system which involved mini electorates. The modified D’Hondt system was then put forward, the bill was approved by both the Senate and House of Representatives and self government became a reality in April 1989. Sorry to disagree with you John but I distinctly remember 2 referendums both of which said NO to self government. They were several years apart from memory. Either way the Hawke government took no notice. Tony Morris and Ashley Wright seem to take the snide approach to disagreeing with Mat Barber’s reminiscences about how Canberra was before self-government. Tony refers to 2 referendums, presumably implying that at some time, Canberrans endorsed self-government. Well no Tony, they didn’t. Both referendums were decisively defeated. Ashley questions whether Mat was even alive before self-government. Well I lived in Canberra for more than 25 years before self-government and my memories coincide with Mat’s, so I can only assume that he was alive at that time. Play the ball not the man guys. I was around before self government too and whilst I agree it was better I don’t think it was significantly so. I think with the passage of time people seem to distort their memories somewhat. I also think many don’trealise that Canberra grew massively during the 70’s and 80’s so much of the town was all shiny and new. Which does have an impact on how things were perceived as things age. Yes, wanniassa grass areas along Longmore and sulwood drive. Seems like areas have to be unusable / unsafe for a few weeks before they are mowed. Giralang pond and Baldwin near Gum st. They do a pretty good job, but nowhere as good as Queanbeyan. FYI, in the fast growing grass months, private contractors mow the main arterial road verges. Government is responsible for the Parks, nature reserves and smaller suburban streets. I have seen a comment from Rose Deo of Forrest to the effect that the untidy state of Canberra’s municipal areas makes her wonder what she pays her rates for. In response, Ben Jones has referred to this as being “spoken like someone from Forrest also”. Not quite sure what Ben’s getting at here, but my reading of Rose’s comments is that, like many people around Canberra, she’s sick of seeing her living environment deteriorate despite paying record rates. Perhaps she’s also concerned that this can only get worse, given reports the ACT Budget is in serious trouble despite record revenues, notably from rates. Maybe she’s also noted yesterday’s reports that the ACT Government’s delays in selling off a number of public housing and other assets around the city has potentially put in jeopardy matching payments from the Commonwealth under the Asset Recycling Initiative, all intended to help pay for Light Rail. Conceivably, she’s seen today’s reports that Stage I of Light Rail risks becoming a White Elephant due to electrical installations along its 12 km that fail to meet required standards. All of this indicates one thing: that Canberrans can expect to pay even steeper rates and receive even less for them than what we’ve experienced to date. So Ben, if that’s what you mean by being spoken like a true Forrest resident, I applaud your response. If on the other hand, it’s intended as a cheap shot at someone simply because they live in Forrest, I’d suggest a rapid move away from Barr-inspired abuse. It's not just the grass either - most old suburban streets and footpaths are lined with debris like bark, gum leaves and wood chips. A lot of green waste comes down and floats around during storms and most of it is never cleaned up. The whole of Tuggeranong. Stop contracting the mowing out, they don't care. They make a horrid mess afterwards and it's not done anywhere near as frequently as it needs to be. It doesn't just look bad, it's a fire hazard and haven for snakes! The problem is ACT Government wide. Contractors. No pride in the job done. In years gone by the mowers were operated by Government employees. These days it is costing more and the work is not up to standard. John Williams did you miss the bit where it said there were something like 73 government mowers supplemented by contractors? Mat Barber oh but we had 2 referendums? Mat Barber where you even alive before self government? You mean the two referendums where we voted NO and still got self government? It's not just grass that's a problem some. Some street name signs are hidden by tree branches. The mowing in Canberra is woefully inadequate! Meanwhile, the arboretum is squeaky clean. what plants have they put in? (just wondering what to avoid planting)? All alongKingsford Smith Drive, both the median strip and footpaths. Looks disgraceful, and also a traffic/ pedestrian hazard due to reduced visibility. In a region known for poisonous snakes, the generally overgrown state of most of our public spaces in both summer and winter is negligent and dangerous. This has little to do with recent weather, the mowing schedule across all seasons is just inadequate, and has been for years now.